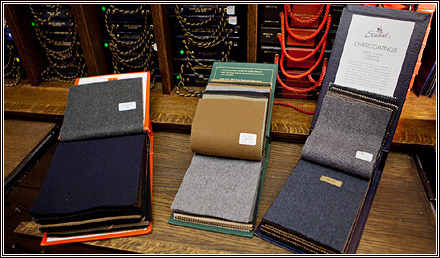 Although it is now relatively late in the season, we are still getting quite a few customers asking for winter overcoats, or sometimes topcoats for the Spring. Here we have a few suggestions for cloth, including some nice greys and navys and a slightly more unusual camel. The majority of the overcoats men ask for are still grey and navy – conservative and ideal for business, but also the most versatile of the potential colours. We’ve seen a few orders for vicuna as well, following the offering from Loro Piana, which adds a touch of luxury to those conservative tones. Beyond that we have a few tweed pieces that are nice, with a varying amount of colour woven in or with a good overcheck. And some customers with a lot of character like very strong patterns, like an oversized black-and-grey gingham check we are in the process of making. Covert coats are also a good option for Spring, though we aren’t seeing too many of those yet. Some of the cloths have a treatment to make them more waterproof, which can be useful in the kind of showers we are seeing at the moment.